Join us in celebrating our extraordinary educators! From preK to high school and beyond teachers encourage, motivate and inspire our students to do their best. Educating children is a critical and challenging job. Please take a moment to thank a teacher who has made a positive impact on your life. This spring our community lost a student - a vibrant and kind young man who made a devastating choice to end his life. Tragically, he wasn’t the first young person we have lost in this manner. Statistics tell us he won’t be the last. Death by suicide is something that occurs in all communities. It doesn’t discriminate. Many of our students and families have been impacted by suicide in some way. This summer we will bring people together to engage in conversations and planning for a community-wide effort to address mental health issues in our area. We’ll invite adults and students to talk about the struggles our young people face - from unrealistic expectations and the anxiety it causes, to bullying, chemical abuse and depression. Ultimately, our goal is to make it acceptable to talk about mental health issues and give people the resources to identify and address issues before it's too late. If you want to learn more, or if you’d like to be a part of this work, visit our website. Stillwater Area High School’s Kabekonian yearbook is being recognized as one of the top 35 in the nation! The Kab is featured in the 2017 Jostens Look Book with its own 2-page spread. The national publication celebrates the best-of-the-best in yearbook design and coverage. The Kabekonian has been featured in the Look Book every year since 2001. Read more. For more than 12 years a dedicated group of volunteers have been working one-on-one with students at Oak Park Elementary. More than that, they’ve developed relationships with students and helped encourage them to work hard and do their best. The Oak Park tutors were recently recognized with a community involvement award from Washington County. Read more. Ninth graders at Oak-Land Junior High are trying to tackle some of the world’s biggest problems. It’s part of the World Savvy Festival. Think science fair meets geography. Students worked in groups to identify some of the toughest issues around the globe – from pollution to lack of clean water and racism to child labor. Read more. Two Stillwater Area High School students are among just 14 in the state of Minnesota to be named Chemistry Olympiad finalists. Alex Daum and Joe Hesse-Withbroe will now go on to compete at the national level. Read more. Students at the St. Croix Valley Area Learning Center had a successful showing at the MAAP (Minnesota Association of Alternative Programs) STARS event. STARS stands for Success, Teamwork, Achievement, Recognition and Self-esteem. 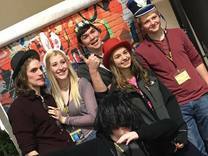 The two-day conference attracts some 200 students from across the state. It gives them the opportunity to demonstrate artistic, career, and life skills they have developed. Read more. If you haven't done so already, please take a few minutes to participate in Thoughtexchange. You should have received an email this week with an invite. Didn't get it? Register online.